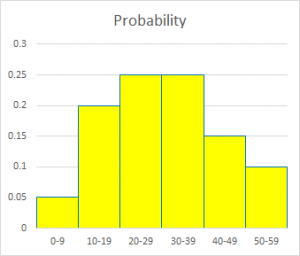 We occasionally got questions about Probability Distribution Functions (PDFs) from students who lacked a full picture of what they are; when I searched for references to give them, I never found one that explained the whole concept as I wanted to. When the following question came in, I took it as an opportunity to create that reference. This week, a student asked some questions far above her current knowledge, that touched upon this topic; I referred her to this page, and took note that it might be one to add to the blog as well. Mike, in 2014, was looking at the subject from a fairly advanced perspective, knowing enough calculus to talk about it in detail; others, without calculus, write to us having been introduced to the normal distribution curve and the basic idea that “the area under the curve is the probability”, but not knowing anything more. I tried to aim my answer at a level that could help anyone. 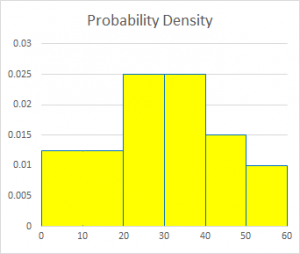 What are the output values of the probability density function (PDF)? And how does the integral of the PDF yield the probability? I get confused thinking about the area as a probability. Look at the example of the odds of k heads for n flips of a fair coin. The output values are the corresponding probabilities, and inputs are k. I know that k goes to the z-score, but what about the probability outputs as n goes to infinity for the binomial distribution? Are they still thought of as probabilities? After all, the curve is approached as n tends to infinity. How is it that, when n tends to infinity, and the shape approaches the PDF, we can take the area to arrive at the probability? I have looked at different explanations of the development of the PDF. To a certain extent, I understand its theoretical development: I understand that this is the continuous case of the binomial distribution, developed from setting up a differential equation with some basic assumptions; I know that DeMoivre derived the curve from Stirling's Approximation and some other mathematical trickery. However, this is not very enlightening, as it is the continuous case of binomial distribution. But it seemed that the underlying ideas were obscured by the detail; he wanted to see the basic concepts, such as what the vertical axis of a PDF even means, and how area comes to be involved. I chose to start with the basics of what a PDF is, to put it all in context. I started with a basic histogram, which is easy to understand. The normal distribution can be derived from many different starting points; the limit of the binomial distribution is just one of them. But I think your real question is about what a PDF means in the first place, and how it is related to histograms. In particular, what does the value of the PDF at a single point mean -- since it clearly is not the probability of that specific value, which would always be zero -- and why is it the AREA under the curve that gives a probability? Am I right about this? When histograms are first introduced, we tend not to present them in the form that is directly related to the idea of a PDF. 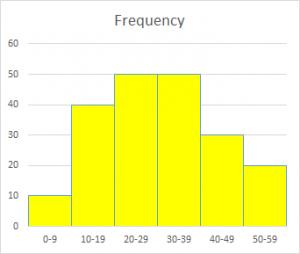 In their more advanced form, histograms are all about areas. So let's develop that idea, starting with the most basic concept and moving toward the PDF. 10 + 40 + 50 + 50 + 30 + 20 = 200.
as we should. And if we think of the width of each bin as being 1, this would make the total area of the bars 1, since the area of a bar is its width times its height. Even if we don't literally say the width is 1, at least the area of each bar is PROPORTIONAL to the probability of each bin, which is what we visually expect: the biggest (not just tallest) bar should go with the most likely event. Here the height of the first bin is the probability of the value being in that bin, which is the sum of the probabilities of the first two bins in the original. But the area is now too large. That bar is as high as the next two not because each value is this likely, but because there are more values in that bin. so the area is the same. But what does the height mean now? 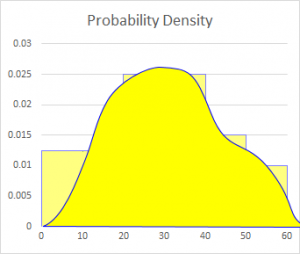 It's the probability DENSITY, defined as the probability of the bin divided by its width, so that the AREA of the bin is the probability of the bin. I have to relabel the vertical axis. In my example, the width of the original bins is 10, so the probability density for them will be the probability divided by 10. I'll also switch over now from labeling the bins with ranges, such as "20-29," to just labeling them with boundaries. And for simplicity, I'll interpret 20-29 as meaning 20 <= x < 30, by thinking of the values as having been rounded down. We now have a fully consistent meaning for the vertical axis, and a fully flexible way to handle the horizontal axis. This is what a histogram REALLY is! Putting it another way, the height represents the instantaneous rate of change of probability (increase in probability per infinitesimally small increase in an interval), so that the probability of an interval is the definite integral of the PDF -- that is, the area under the curve. Thanks, Dr. Peterson. That was the exact explanation I was hunting for. The doctors of Dr. Math are brilliant at their explanations of mathematical concepts.